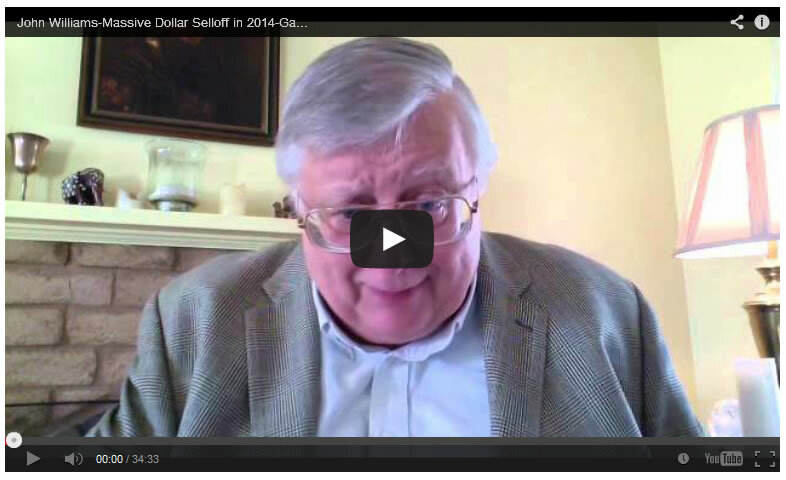 Economist John Williams thinks 2014 will mark the beginning of hyperinflation. Williams contends, “You are going to see, early on, a crisis in the dollar that will start to trigger the inflation . . . as the inflation picks up, that’s going to savage the economy, which is already in a depression. It never recovered.” Forget what you have heard about the so-called recovery. Williams says, “The consumer is in trouble. There is nothing happening to turn the economy around.” The weak economy is bad news for the dollar. According to Williams, “Anything that would suggest deficit deterioration here, and a weak economy would do that, will have a devastating impact on the dollar.” And if foreigners start selling some of the 12 trillion U.S. dollar based assets, such as bonds and currency, things will turn ugly fast. Williams says, “We’re dependent on the rest of the world continuing to go along with us and continue to support the dollar. That’s not going to happen.” So, the big question everyone is asking is when will the buck take a hit in value? Williams says the dollar will likely begin selling off before the middle of this year, and he adds, “It’s really going to be a currency panic . . . when the fundamental selling pressure really starts to pick up, when the selling gets heavy . . . in turn, the weakness will be seen in a spike in oil prices and a spike in gasoline prices.” Williams says there will be a panic out of the dollar and he predicts,“Once you see a massive sell-off here, I see the game as being over.” Join Greg Hunter as he goes One-on-One with John Williams of Shadowstats.com.